There are two types of keywords referral data: organic keywords referral data and paid keywords referral data. Google does not hide the ‘paid keyword referral data’. 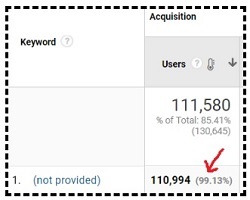 All web analytics tools (including Google Analytics) are not able to report on majority of ‘organic keyword referral data’ from search engines like Google. 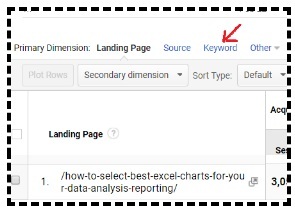 Google Analytics report ‘not provided’ in place of actual organic keywords in your organic search traffic reports. 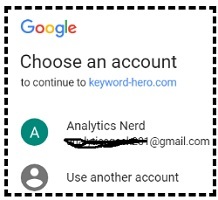 By using the ‘keyword hero’ tool, you can get most of the ‘not provided’ keywords (not all) back in Google Analytics. 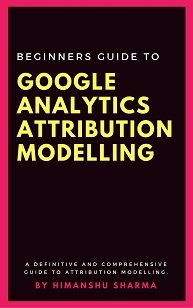 What I understand is, they pull the search data from Google Search Console, use several data sources (Google Analytics, rank monitoring tools, bing search API, browser extension data etc) for keywords clustering & classification and then match it with the GA session data using some machine learning algorithm. If you want to go in great technical detail regarding its working then here is the 33 pages long description. Does this tool really works? Just like you, I was skeptical about this tool. But I give it a shot. They a provide a free trial, so there is no harm in trying it. I can now see thousands of new organic keywords referral data which were earlier hiding behind the ‘not provided’ keywords. What about accuracy of the data? 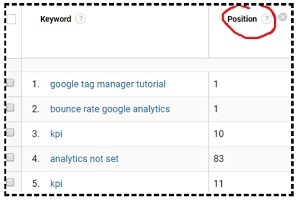 First be glad that you are able to see organic keywords referral data once again in GA.
Something is better than nothing and right now that nothing is ‘not provided’. As far as I see the keywords reported by this tool in GA are pretty accurate. I do not trust the search engine ranking positions data and other website usage data provided by this tool. But then I do not trust the search engine ranking positions provided by any rank monitoring tool. 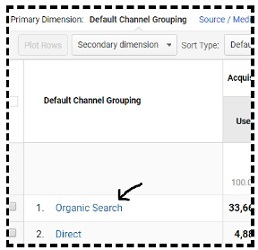 #1 You can see organic keywords data and correlate this data with sales and other conversions in your Google Analytics reports. This will help you in better understanding the performance of your organic search campaigns. #2 By using organic keywords data you can optimize your landing pages for the keywords which are most likely to result in traffic, sales, leads or some other conversions. #3 You can develop more contents around the organic keywords that have already proven to generate traffic and conversions for your website. #4 You can once again understand the performance of your branded organic keywords in terms of generating traffic and conversions. #5 You can once again compare the performance of branded and non branded keywords with each other. #6 Once you understand the keywords for which your website is ranking really well on Google, you can stop bidding on them in Google Adwords and can greatly reduce your ad spend. #7 You can discover new keywords for your paid search campaigns. So if an organic keyword is performing really well for your business but your website is not ranking very high for it, you can target that keyword through your paid search ad campaigns. #8 You can see the search engine ranking position (SERP) of your website on Google for each keyword. This can help you in improving your SERP for profitable keywords and increase sales through organic search. 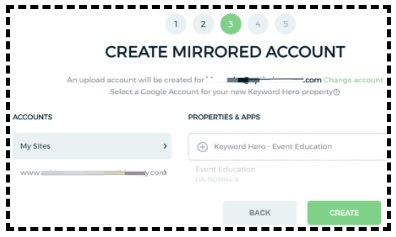 #9 By using the ‘keyword hero’ tool, you get competitive advantage as a marketer/advertiser. I mean how many marketers know that they can get back organic keywords data back in Google Analytics. Only handful. The majority think that organic keywords referral data is gone for good. #11 When you use the ‘keyword hero’ tool for the first time, it creates a new GA property and a new reporting view called the ‘keyword view’. This view comes with ecommerce tracking enabled. So if you are currently using ecommerce tracking, the ecommerce data will automatically start flowing in the ‘keyword view’. (not provided)_bing is the ‘not provided keywords’ traffic from Bing search engine. (not provided)_yahoo is the ‘not provided keywords’ traffic from Yahoo search engine. (not provided)_subdomain_add_searchconsole is the ‘not provided keywords’ traffic from the sub domain which is not added to the keywords hero account. 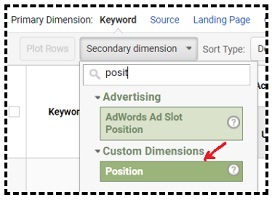 You can use these dimensions and metrics straight away once you start seeing data in your ‘keyword view’ report. #1 It does not completely fix the problem of ‘not provided’ keywords. 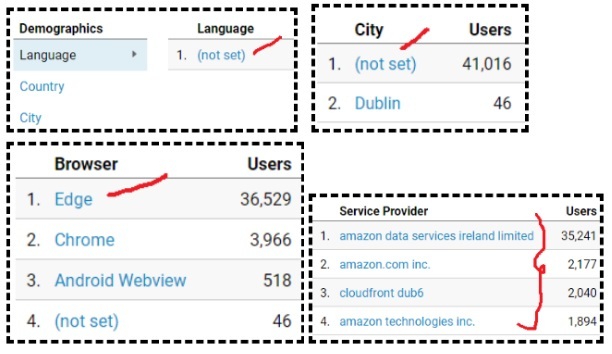 You will continue to see some ‘not provided’ keywords in your reports. 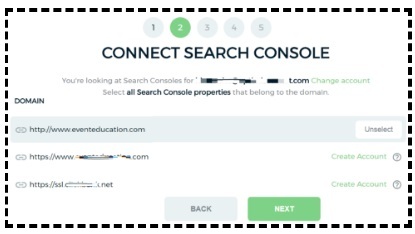 #2 In order to use this tool, you would need an active Google search console account with historical data and this account must be linked to your live Google Analytics property. #3 If you are a low traffic website (less than 100 sessions a day) or you get majority of your website traffic through paid marketing campaigns then this tool won’t be much beneficial for you. 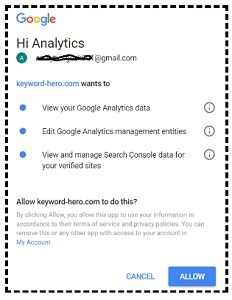 #4 If you are a high traffic website and you continue to use their free plan or use a plan which is too small for the number of web pages you want ‘keyword hero’ to analyze then it can negatively affect your keywords data quality. 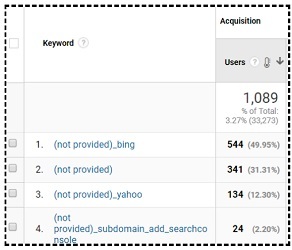 You are also more likely, to continue to see, high percentage of ‘not provided’ keywords in your GA reports. If you want to minimize the percentage of ‘not provided’ keywords in your reports then use the right plan. #5 This tool creates a new GA property and send all of the keywords data there. Now there are both advantage and disadvantage of that. The advantage is that the use of this tool does not skew your current analytics data. So if in the future you decide not to use this tool, it won’t affect your current analytics data. This disadvantage is that the new GA property does not inherit many configurations settings from your live GA property and views. What that means, if you have set up goals in your current GA view then they do not automatically transfer to the new GA property. So you would have to set up goals once again in the new GA property’s view (the ‘keyword view’). 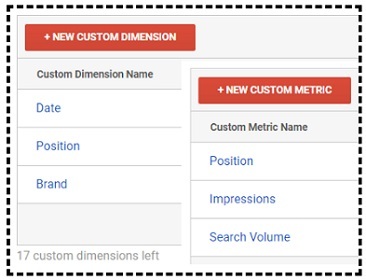 If you have set up custom dimensions and metrics in your live GA property then those dimensions and metrics will not automatically transfer to the new GA property. So you would have to set up the custom dimensions and metrics once again for the new GA property. 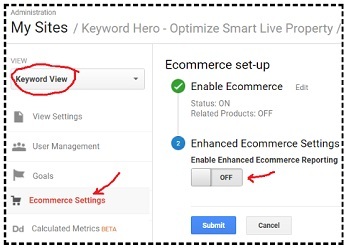 Similarly, view filters, content groups, channel groups, calculated metrics and many other configuration settings do not automatically transfer to the new GA property created by the ‘keyword hero’ tool. So you would need to set them all up, all over again. That is because the data reported by ‘keyword hero’ tool is 3 days old. #8 This tool is still in beta. How to use the Keyword Hero Tool? Step-1: Make sure you have got an active Google Search Console account with at least a month of historical data. Step-2: Add your Google Search Console account to your live Google Analytics property. Step-3: Login to your Google Analytics account. Step-4: Get ‘edit’ permission at the account level so that you can add new property to your GA account. 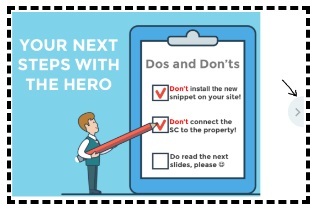 Step-5: Navigate to https://keyword-hero.com/ and then click on the ‘Try him now’ button. Note: The team at ‘keyword hero’ refer to their tool as ‘him’ on their website and in all help documentations. So don’t get confused here. 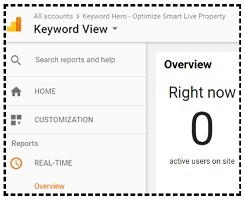 Step-7: Choose your GA account & property and then select the view you want the ‘keyword hero’ tool to analyze. Note: You can select only one conversion at a time. 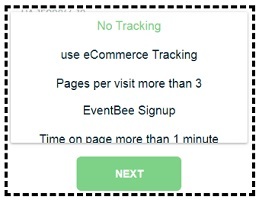 I tend to select ‘use ecommerce tracking’. Step-11: Click on the ‘create’ button. For majority of websites the ‘Giant hero’ plan is good enough as it checks the top 1000 most frequented web pages for the organic keywords referrer data. 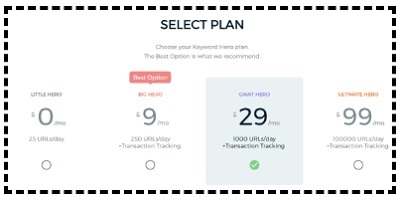 However select the plan depending upon number of web pages you want ‘keyword hero’ to analyze. Note: All paid plans come with 30 days money back guarantee and the Conversion tracking is only available for paid plans. You can also select ‘Little Hero’ plan which is free to use, if you just want to get your feet wet and see whether it really works for you. Step-13: Click on the ‘next’ button. Below this message, there is slide show. Step-14: Once you have viewed the slide show then click on the ‘Done’ button. 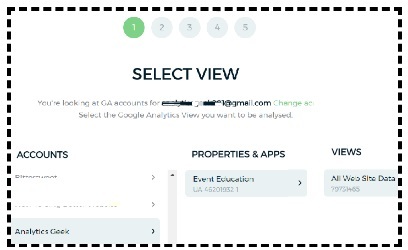 You will now be automatically redirected to the ‘Channels’ report of the ‘keyword view’ of the new GA property. 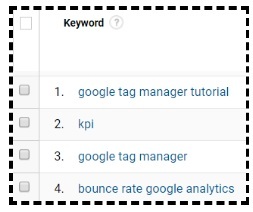 Case Study #1: How to see the average search engine ranking positions in Google Analytics? Though ‘keyword hero’ tool you can see the average search engine ranking of your website on Google for each keyword. Case Study #2: How to see the list of all the keywords which are sending traffic to particular landing page? 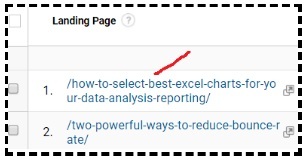 Step-1: Navigate to Behavior > Landing Pages report in the ‘keyword view’ of the new GA property created by ‘keyword hero’. You can then see the list of all the keywords which are generating traffic and conversions for the selected landing page. That’s how you can use the ‘keyword hero’ tool.